A while back, I had been poking around the Mini-painters group and found a quick little snapshot of someone's wet pallet. I had always had a problem keeping my paints in a liquid form long enough to make a difference. So I had tried this little bobble and found that it helped tremendously - not only with keeping the paints wet, but also with my overall painting - since I was able to blend colors and keep them wet long enough to keep the same color consistant over the whole miniature. So I had started with the back half of a Rackham Confrontation blister. I had seperated the front and the back along the hinge. Now the blister would open and close with a seperate lid rather than like a clam shell. The original wet pallet (from the mini-painters group) called for a wet paper towel and a cut sheet of parchment paper. This method worked well enough, but the paper towel would not remain wet for more than a day or two and the parchment allowed the water through to easily. So I began looking for a new solution in the same packaging. I visited my local craft store and found an honest-to-god wet pallet made by a company called Masterson, but at 15" x 11" and $20.00 US it was far to large and costly than I was willing to pay. However, the supporting elements of the pallet were more of what I was looking for anyway. The pallet included a compressed sponge and some acrylic pallet paper. Naturally these items were the size of their retail pallet, but being only paper and sponge they were easy to cut and apply the way that I needed them. With the expenditure of $7.50 US I purchased one package of the Sponge and one package of 30 sheets of pallet paper. Not bad in my opinion. I had taken the items home and decided that the proper size to fit my blister would be 2.5" x 3.5" - about the size of a normal playing card. I determined the best use of the sponge and paper was to measure the longest dimension along the longest edge of the paper. I drew the appropriately sized lines on the paper and sponge then used a metal ruler and a new sharp hobby knife to cut the pieces into the appropriate sized rectangles. With these measurements I yielded 12 sections of each paper and sponge. With 30 sheets of pallet paper, I was going to be in business a very long time. The sponges will last a long while also, so I have yet to discard the first piece. Here you can see the compressed sponge in the back half of the blister. Now that I had all of the pieces cut to a uniform size, all I had to do then was to prepare the pallet for its first use. 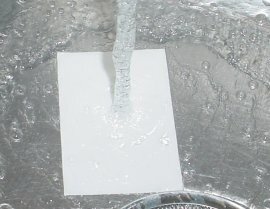 First I ran some hot water in the kitchen sink then lain the pallet paper in the sink with the water running directly onto the paper for about a minute. At this point the paper became semi transparent as it absorbed the water and became saturated. The next step was to wet the sponge. At first I wasn't sure that the sponge would fit into the pallet once it was expanded. So I needed to try and figure it out for myself. So I moistened and rinsed the sponge in water in the sink. There are some form of chemicals or adhesives that keep the sponge compressed, so rinsing it released these chemicals and allowed the sponge to expand to about a quarter inch in height - perfect for the blister container I wanted to use. After rinsing for a few minutes, I lain the sponge in the sink and ran Cold water directly into it again for about a minute. The sponge was saturated at this point. I picked it up by a corner and let some of the excess water drip off without ringing. I then laid the sponge in the blister backing, then the wet pallet paper on top of the sponge and neaded any air bubbles out from under the paper. I used a a paper towel to wipe of excess water dropplets from the top of the paper and VIOLA! I had a brand new wet pallet. 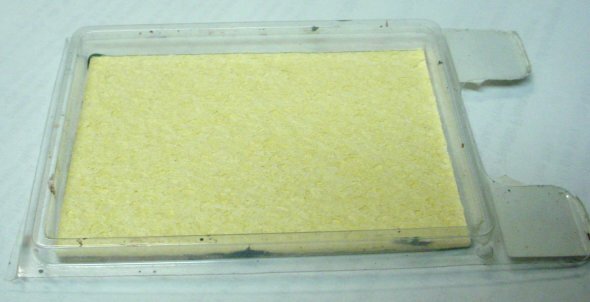 After using the pallet for a couple of days, I would through out the paper and wash the sponge to help remove any mildew or paint that managed to soak into the sponge while mixing. I have also found that Distilled Water helps to keep mildew out and also keep the paints from pooling - often a trick to remove the pooling effect is to add a few drops of dish soap. Also a 1/4 teaspoon of ammonia added to the blister will remove any possibility of mildew buildup or smell. The ammonia does not effect the sponge, paper or even the paint. When I was finished painting for the day, I would just place the lid of the blister over the backing and store it in a safe place. Obviously blisters are not water or air tight so evaporation or spillage is a possible problem. Keeping the pallet level and replacing the lid when not in use will reduce the amount of evaporation tremendously. In cases where the pallet had to travel with me, I would slip it into a zip-lock storage bag and place it in a location where it would most likely remain level throughout the trip.